In a survival situation, especially in the wilderness, a survival knife is the most important tool you can have. Your knife is important for cutting wood and cordage, batoning wood, hunting, making traps, the list is endless. Because a good knife is so important, it makes sense to ensure that you have the right knife for the job. First lets talk about a few things you should avoid in a survival knife. Double edged blades do not make good survival knives. They are designed more for thrusting rather than cutting or chopping. They are not very functional in a survival situation and tend to have weak tips that can be broken off. Remember reliability is everything in a survival knife and a double edged blade also doesn’t have a thick spine, so it would be impossible to baton wood with it. Stay away from Rambo style knives, they are not real survival knives even though they are portrayed that way in the movies. They are more for show than anything because of their aggressive looks but are too heavy and not very practical for survival chores. So what options make the best survival knife? Here are some important things to look for when buying a survival knife. 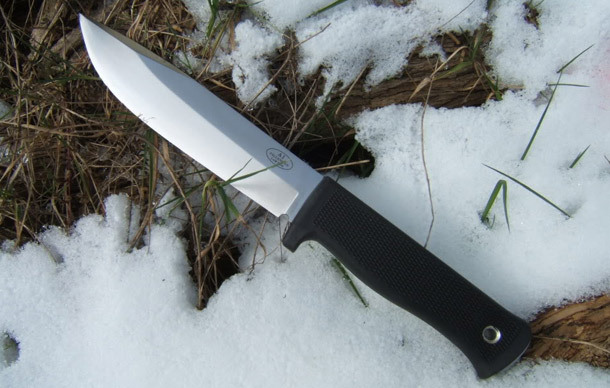 Fixed blade – Survival knives must be durable, reliable and be able to take a lot of abuse. A folding knife isn’t any of these. Although a folder can make an excellent back-up knife, your primary survival knife should always be a fixed blade, preferably with a full tang. Full tang means that the blade goes right through to the end of the handle. This adds extra strength and durability to the knife. In a survival situation, reliability is everything! Plain vs serrated edge – A primary survival knife should always have a plain edge. A serrated edge might be more useful in an urban environment as its best strengths are for cutting synthetic materials such as rope and seat belts, but a plain edge can still do these things and do everything else a lot better. Also a plain edge blade is easy to sharpen at home or in the field, where a serrated knife is much more difficult and requires specific sharpening tools. Blade shape – Avoid blades with a point that is relatively thin or narrow. Remember reliability is top priority and thin or narrow points can break easily. You want a sturdy point that can take plenty of abuse, but still be used for finer survival chores. A drop point blade is probably the best option for an all round survival knife. You also need a blade with a decent curved edge on the bottom called the belly, which comes in handy for chores such as slicing and skinning. Blade Size – Survival knives must be robust enough to handle the abuse of outdoor survival yet small enough to be comfortable for smaller jobs. A good thickness for the blade should be around 1/8 inch or between 3 to 4 mm. This gives you enough strength for heavy duty jobs while still be effective at slicing and smaller tasks. A good blade length would be around 4 to 5 inches long or between 100 and 125mm. Anything less than 4 inches long would make wood batoning almost impossible. Handle – A good handle should feel comfortable in your hand and be made of a durable material. Avoid handles that are hollow or plastic as they will not be dependable. A couple of nice features to have is a lanyard hold and a blunt flat edge at the end of the handle. The lanyard hole is great for putting a rope through so you can attach your knife to your wrist or another piece of gear. The blunt edge on the end of the handle is good if you find yourself needing to hammer something. I love my Old Timer! I have always cairred one,in fact the same style,Schradeae Old Timerae Gunstock Trapper Linerlock. But I must admit, I didn’t care for the fact they are now made in China and made with SS blades instead of the old high carbon blades like the ones I grew up with. But, dollar for dollar, they are still a very good knife. I’m going through a buy American stage in my life. So I’m switching to a Case Mini Copperlock. I’m getting the one with the same type of handle material that my Old Timer has, Delrin. You just can’t beat Delrin for a synthetic knife handle material.Enough rambling! Thanks for your site. And don’t get me wrong. I still feel Old Timer is a good knife. I think the Schrade SCHF9 is a great low cost option. Under $40.00. 1095 carbon steel, full tang, flat grind. It’s a big chunk of steel, really heavy duty. There’s a beautiful Fallkniven A1 pictured in this article. But you don’t need a $200 knife made of exotic steels like D2, or CPM440V in order to qualify it as capable. It’s like saying that you need a BMW R1200 to go touring on a motorcycle. A Gerber Big Rock for $30, for example, is an excellent choice and will do the job not to mention you’re not going to feel bad if you lose it. Becker Knife & Tool (now owned by KABAR) also have awesome hard use knives of all shapes and sizes that won’t put a dent in your pocketbook but can keep up with any $200+ exotic knife. MORA knives are less than $20, are excellent knives, and great to have as a back up knife but their lack of full tang (they use a “rat tail” insert) make them less suitable for hard use. they are suited more as a bush craft knife. But there are so many options out there without having to spend big bucks on an exotic knife and without getting snobby in regards to what the blade material, and scales (handles) are made from.